Tinkering around in the garden early this afternoon and I heard the buzzing…I looked up to see hundreds of golden sparks swirling in the wind. They were seeking, questing, on the hunt. When they started to land on the ladder that holds up the grapevine, I ran in the house and got on the phone. Within half an hour, Katie and Chris showed up with bee stuff. They are experienced beekeepers and have caught many swarms. This one was challenging, because the insects were gobbed up on the ladder rather than a tree limb. 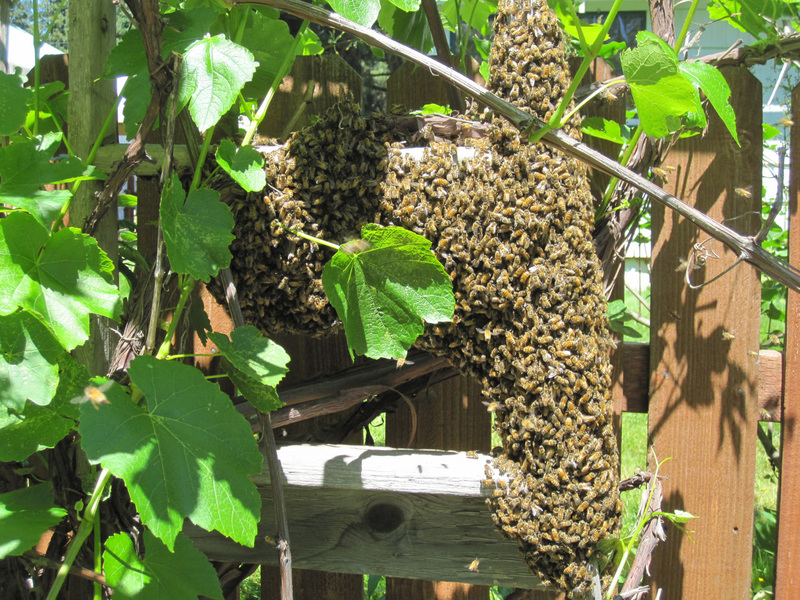 Bees swarm when one hive has two queens and it is time for the colony to divide. My neighbor Stephen has also kept bees, and was a big help in getting these bees inside the temporary box that Chris held. The box contains frames with beeswax foundation. The worker bees want to be where the queen is. We never did see her, but figured she had to have gone in with one of the blobs because the workers were staying around. 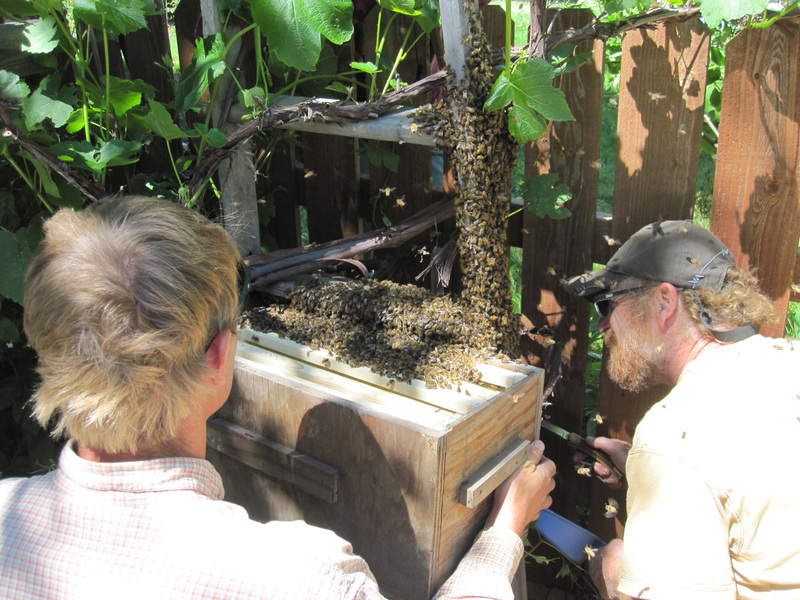 When most of the swarm was inside the box, the lid was carefully placed on top. The box rests above the ground by the grapes and herbs. I have always liked honeybees and bumblebees. The garden I have created here is always full of them in the spring and summer. They are especially fond of the catmint flowers. I can watch them for a long time. Bees are peaceful. No one was stung today, even though we all were in their midst. 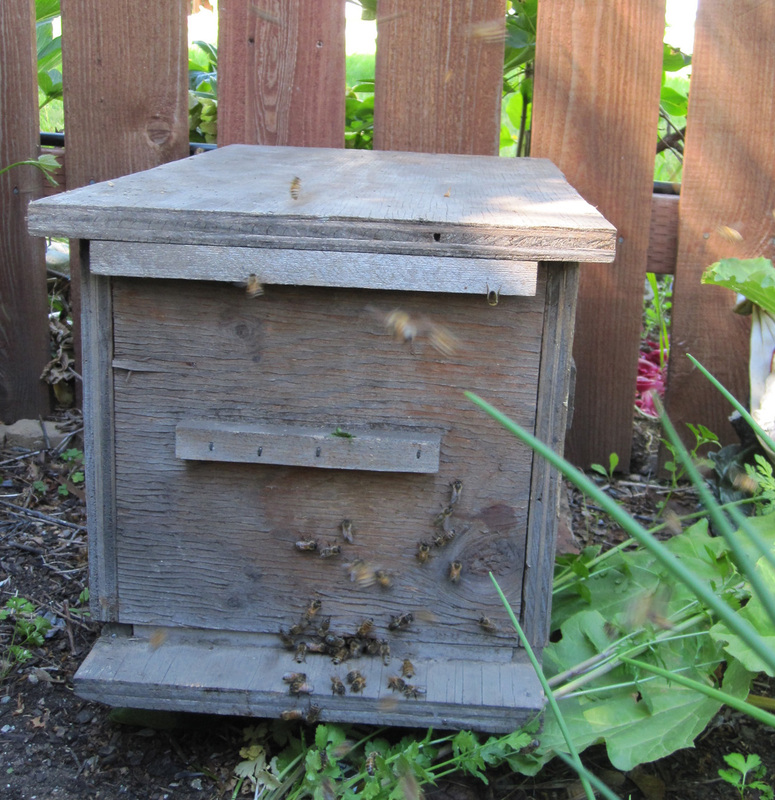 Bees are intent on their business, carrying out their biological imperative. They collect nectar, pollinate flowers, return to the colony, communicate by waggling and dancing, contribute to the good of the order. Their society is mostly female. Beekeepers are peaceful too. Chris and Stephen both spoke to the bees in even tones, made no sudden moves, and were knowledgeable while still fascinated. The name Deborah means “queen bee” in Hebrew. The Deborah of the Old Testament led an army to victory. To be a Debra with bees feels right and proper. When I was little, my Grampa sometimes called me “Bee Bug”. I will tend to these bugs, share my garden gladly with them, and build them a fine hive. If they have extra honey, I will steal some for my own use. I will do my best to get them through the winter so that we can all enjoy another flowery summer and fruitful harvest. My garden is complete (although still a work in progress). Today I became a beekeeper.